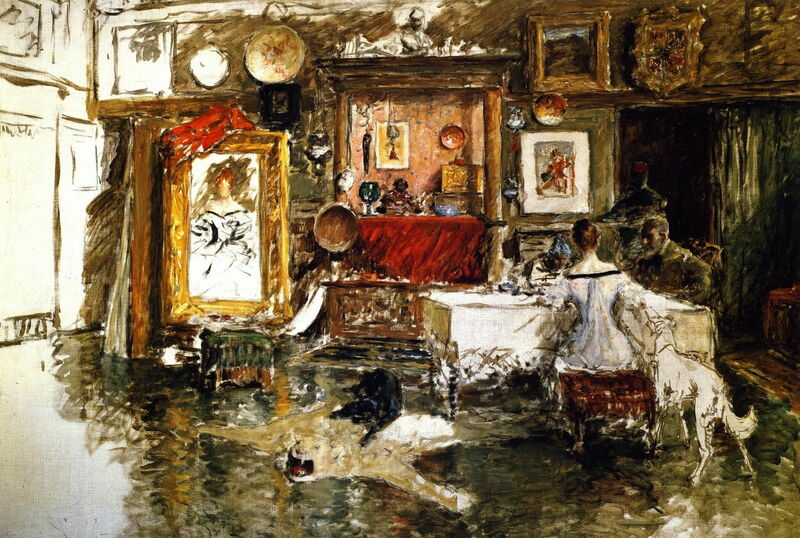 William Merritt Chase was born just five years later than Thomas Eakins, and they both had the benefit of a European training. Yet their paintings and working methods were so different. Chase seems to have painted Impressions – generally direct or alla prima, straight onto the canvas, working progressively from a rough sketch to the finished work. Eakins took several months if necessary, producing drawings, sketches, and photographs before starting the final painting. This article illustrates these contrasting approaches. 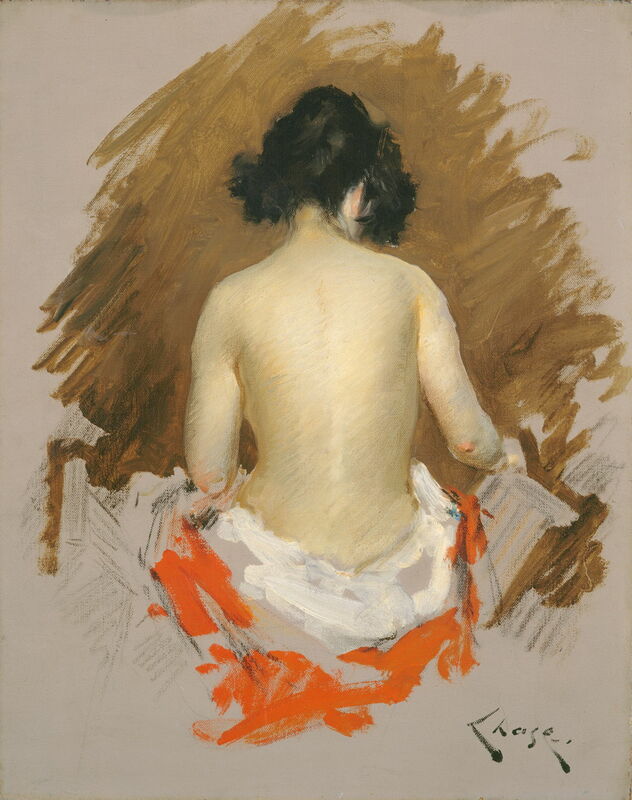 There are occasions when Chase must have made quick sketches from life, which he then developed into a more formal painting – when he and John Singer Sargent painted La Carmencita, the dancer, for example. But his plein air landscapes, pastels and oil sketches of his family and others, all appear to have been virtuoso performances. A few of his unfinished paintings have survived, and they reveal how he started with a quick sketch using diluted oil paint, then progressively brought areas into better detail. These unfinished works show passages at different levels of completion. As with many skilled portraitists and figurative painters, the figure was usually the most advanced part of any painting, during its production. There do not appear to be matching ‘finished’ paintings which originated in surviving oil or pastel sketches, although it is always possible that his sketches were normally destroyed once a finished version was complete. 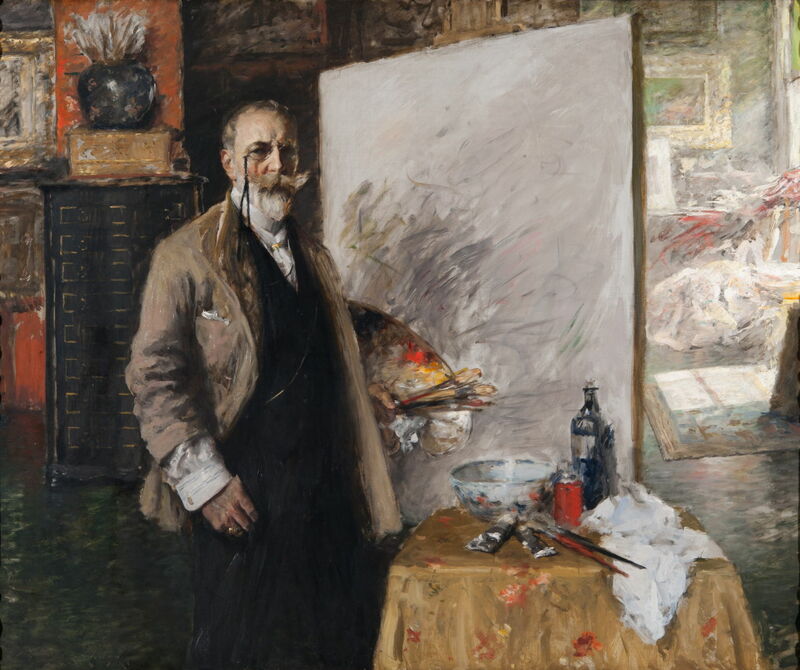 Most of Eakins’ paintings were preceded by extensive preparatory work, although individual sketches may not have proceeded in a particularly methodical fashion. 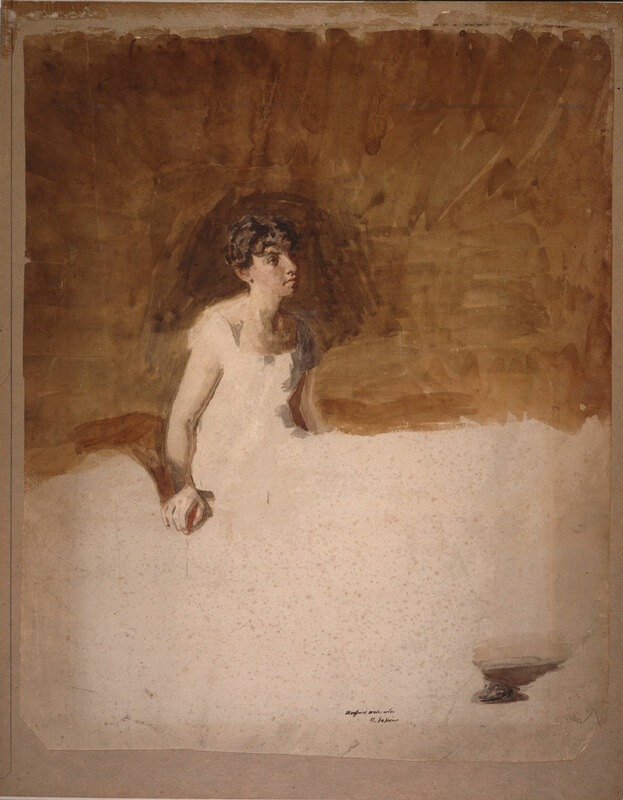 Thomas Eakins (1844–1916), In the Studio (unfinished) (c 1884), Watercolour on paper, 53.3 x 43.2 cm, The Philadelphia Museum of Art (Gift of Louis E. Stern, 1950), Philadelphia, PA. Courtesy of the Philadelphia Museum of Art. He abandoned this watercolour study of a woman’s portrait when her head was well advanced, her body still very sketchy, but her left foot is almost as advanced as her face! A faint graphite sketch is visible in between the body and foot, which he was presumably developing in watercolour when he abandoned. 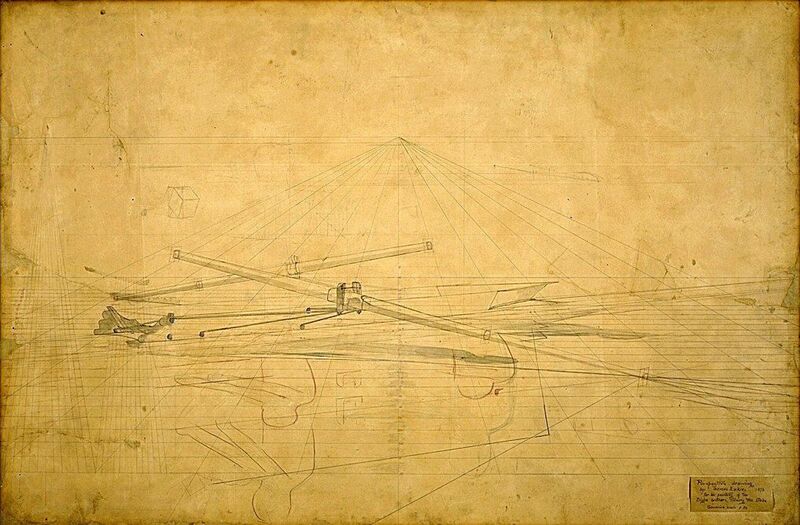 For several of his works, particularly the highly geometric paintings of rowers which he made in the early 1870s, he made formal perspective drawings. 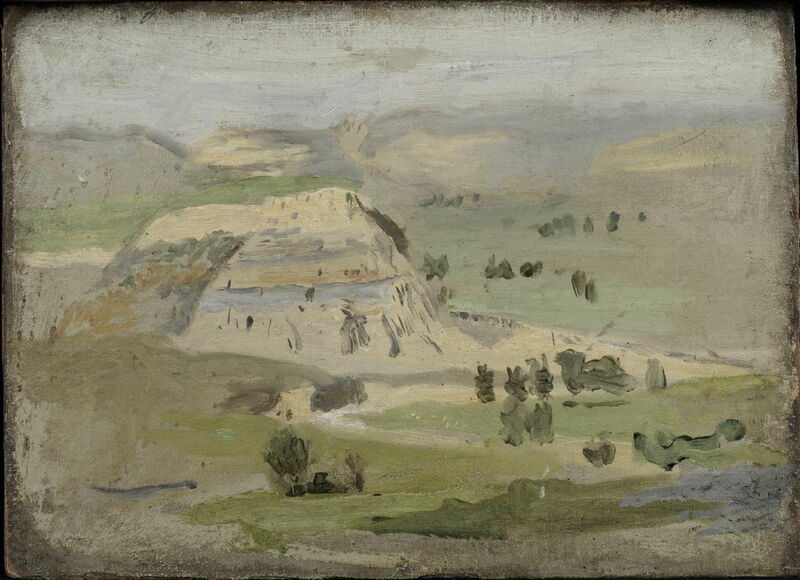 For later paintings, he also made extensive use of photography to supplement and at times replace the sketchbook. This is evident in his preparatory studies for Swimming (1885), which grew from a series of photographs taken by Eakins and others. But photos never replaced his own sketches: for this work, Eakins made several figure studies, details such as the dog, and different landscape backgrounds, and then brought them together in oil sketches. 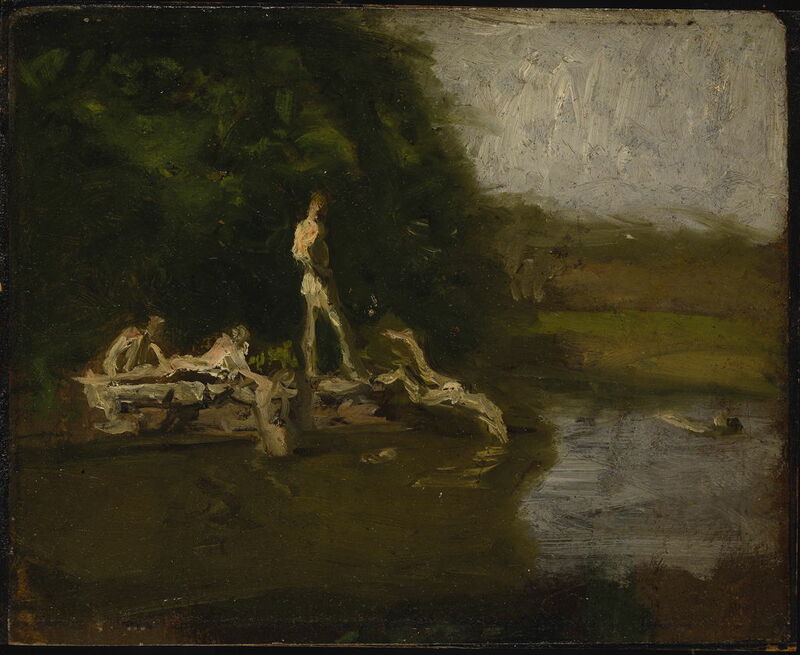 Thomas Eakins (1844–1916), Swimming Hole (sketch) (1884), oil on fiberboard mounted on masonite, 22.1 × 27 cm, The Hirshhorn Museum and Sculpture Garden, Washington, DC. Wikimedia Commons. Once he was happy, he embarked on his final version. In at least some cases, including his paintings of shad fishing from 1881-82, the figures in his Arcadia (c 1883), and Swimming (1885), he put final photographic images into a ‘magic lantern’ projector, which he then projected at the canvas. He developed a sophisticated system not only for using the projected image to make a graphite underdrawing, but as the painting progressed, to incise key points and lines of reference in the paint surface. This enabled him to create paintings which were accurately calibrated to his reference images: a great advance on the traditional system of enlargement using grids, and one factor in his detailed realism. This technique was discovered by Mark Tucker and Nica Gutman, and detailed in their chapter in Sewell (2001). 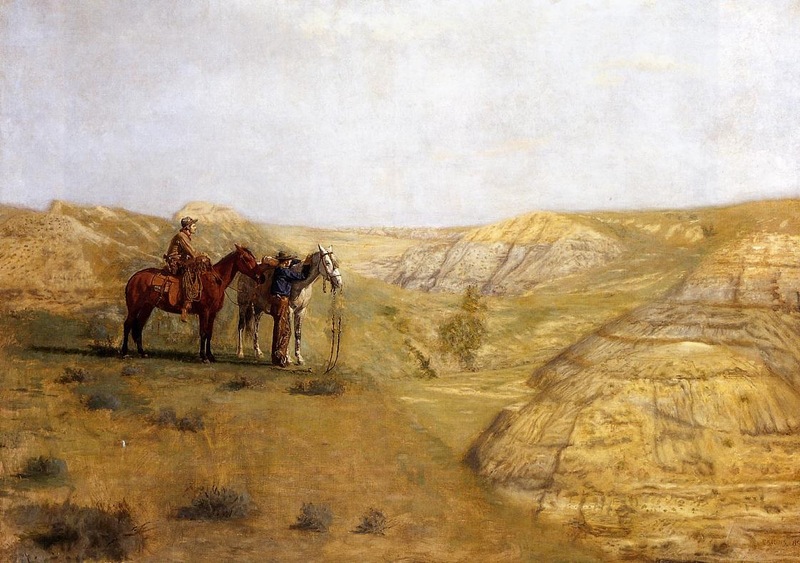 For his Cowboys in the Badlands (1888), Eakins wanted to use a Dakota landscape, for which he had to work in front of the motif, in Dakota. Thomas Eakins (1844–1916), Landscape sketch for ‘Cowboys in the Badlands’ (1887), oil on canvas on cardboard, 26.7 x 36.8 cm, The Philadelphia Museum of Art, Philadelphia, PA. Wikimedia Commons. Thomas Eakins (1844–1916), Sketch for ‘Cowboys in the Badlands’ (c 1887), oil on canvas on masonite, 26.5 x 36.8 cm, The Philadelphia Museum of Art, Philadelphia, PA. Wikimedia Commons. 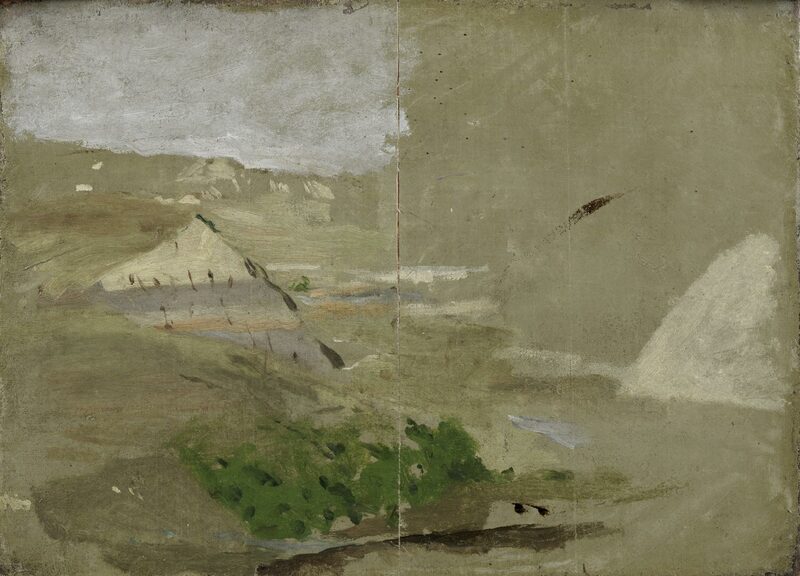 Eakins lacked Chase’s virtuoso plein air painting skills, but returned from Dakota with some rough oil sketches which were sufficient for the purpose. 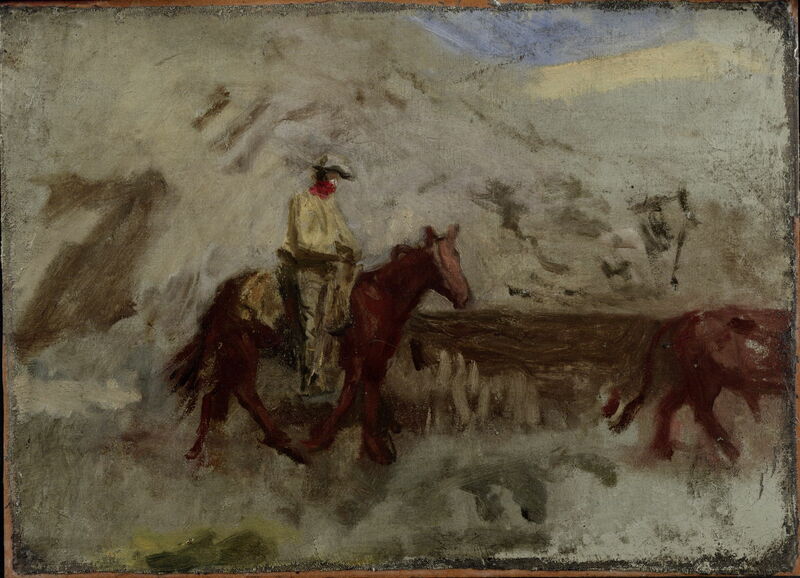 Thomas Eakins (1844–1916), Sketch for “Cowboys in the Badlands” (1888), further details not known. Wikimedia Commons. 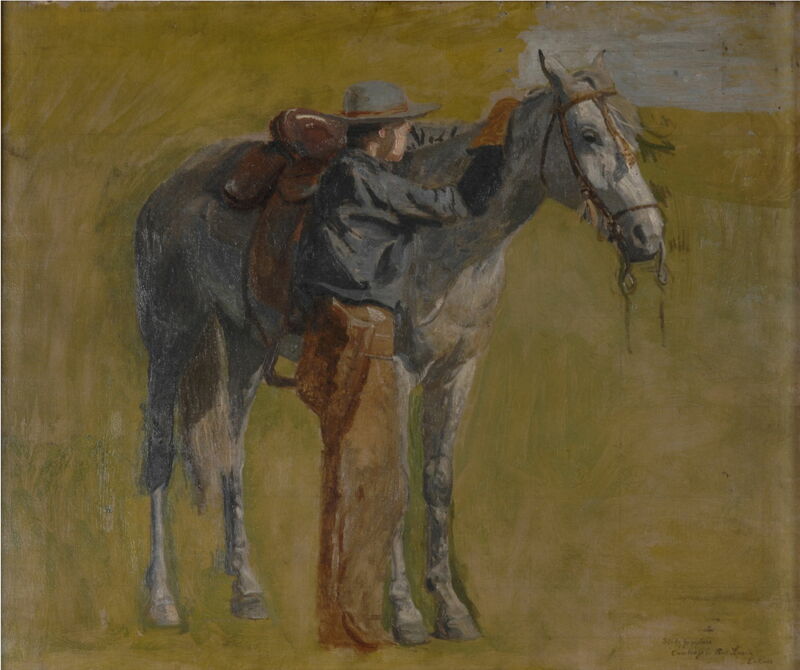 He made studies of the figures in both Dakota and Pennsylvania (Eakins had his own horse), and of details such as an appropriate saddle. 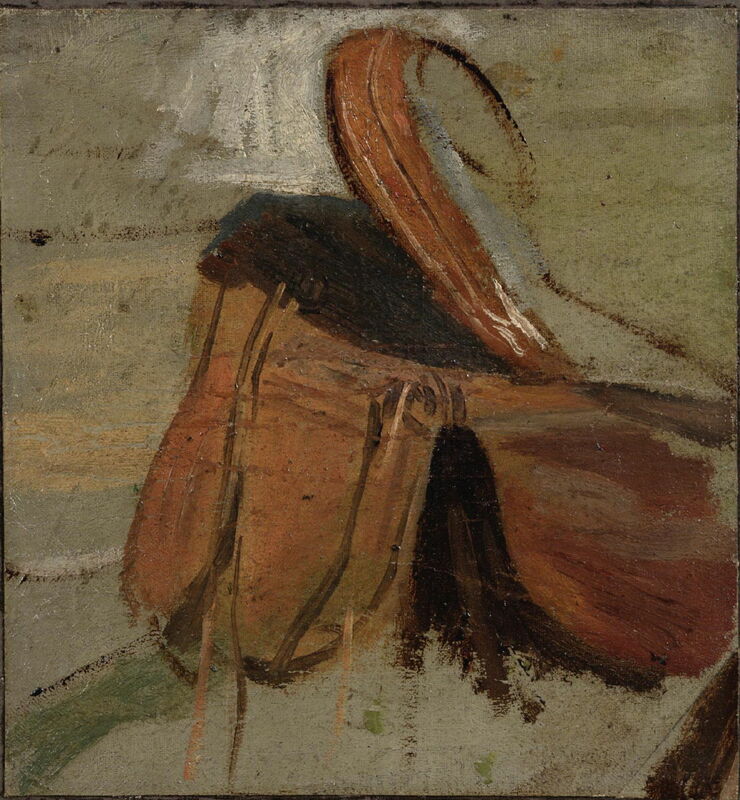 Thomas Eakins (1844–1916), Saddle (sketch for ‘Cowboys in the Badlands’) (1887), oil on canvas on cardboard, 17.6 x 16.4 cm, The Philadelphia Museum of Art, Philadelphia, PA. Wikimedia Commons. These were then assembled into the final painting in his studio. Chase and Eakins were painting at a time when working practices and methods were changing very rapidly. Their generation was the first to be able to use photography as a substitute for some sketchwork, although it was still a clumsy and specialist process. While Chase left his wife to wield the camera, Eakins saw it as a valuable tool, and to some degree an end of its own, although it was Eakins’ wife Susan who pursued it as an art in its own right. Their use of photography may have been as contrasting as their methods of work, but in one respect they were united: their appreciation of the work of Eadweard Muybridge. Chase collected his photographs, Eakins worked with Muybridge and even invented his own system for recording motion in photographs. Those were exciting days. Posted in General, Painting, Technology and tagged Chase, drawings, Eakins, Impression, Muybridge, perspective, photography, realism, sketch. Bookmark the permalink.